Grossman Publishers, 1975; 80 pp. ; First American Edition; glossy pictorial hardcover with printed boards; 12" H x 9" W; 28 full page color plate illustrations. The Butterfly's Ball, and the Grasshopper's Feast is a poem by William Roscoe, written in 1802, and telling the story of a party for insects and other small animals. 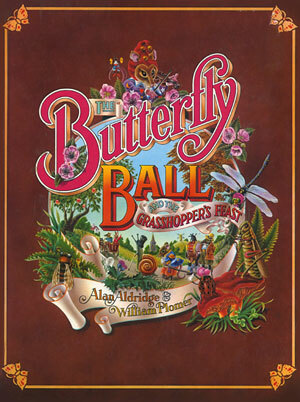 This book, The Butterfly Ball and the Grasshopper's Feast by Alan Aldridge and William Plomer, is loosely based on the poem. This greatly expanded and altered the original work, focusing more on the animals' preparations for the Ball. Aldridge went on to create two more books based on the sequels: The Peacock Party and The Lion's Cavalcade. William Plomer was a South African novelist, literary editor, and poet. Alan Aldridge is the British artist whose airbrush illustrations of fantasy scenes defined the graphic style of the sixties. Working with some of the greatest artists of his generation, including the Beatles and Andy Warhol, Aldridge created groundbreaking posters, book illustrations, and album covers. His debut children’s book, THE BUTTERFLY BALL AND THE GRASSHOPPER'S FEAST, won the prestigious Whitbread Children’s Book Award. Sample plates from the book are show below.